For years I sporadically collected topographical postcards of the area I live in, like many people do. Then I found this photograph at a table-top sale in Cromford, where I live, and bought it for 50p. It was the beginning of my obsession for collecting real old photographs and it grabbed my attention because it was so intriguing. What’s going on here? When was it taken? Does it have any real meaning? 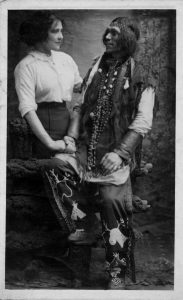 The man looks like he’s a Native American although it could just be someone dressing up for a tourist photograph. Maybe he appears in hundreds of photos with many different people shaking his hand. Was it taken somewhere in the USA or in a studio in Basingstoke? When I acquired it there was no way of telling. As time went by and I learnt more about old photos and real photographic postcards, the mystery only deepened. Photographic postcards were produced by the million and they weren’t all of famous landscapes or people. Anyone could go to a studio, have pictures taken and then have them printed on postcards to send to their friends. However, this isn’t a photo postcard. A postcard has specific dimensions, markings on the back such as a divider and a stamp box and almost always the name and address of a photographer and/or the studio he or she worked for. This photograph is bigger than a postcard, has nothing on the back and is clearly a real photograph (as opposed to a real photographic postcard). Even if the man was hired out to appear with anyone who would like to be seen with him there would likely be, at the very least, a studio stamp on the reverse. There isn’t. It’s probable that I’ll never know who these people were or the circumstances that led up to the photograph being taken but that’s what makes it so intriguing. It would be great to one day know the full story but it’s also fun to speculate what’s going on and keep searching for an answer. The only trouble now is that I have hundreds of photographs, every one of them with a mystery to solve. And that’s how my obsession with collecting old photographs began.